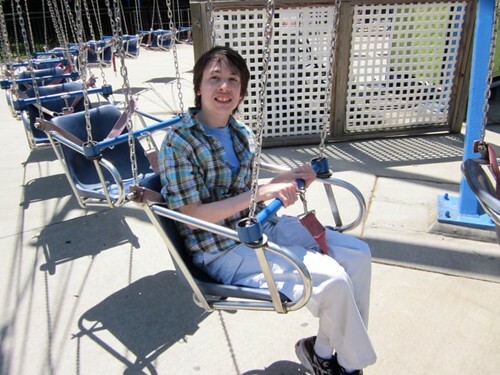 I would like to you to meet Jeffrey, a special boy who was born with a seizure disorder. Through the years, it became apparent that he also has some mental and physical limitations. Those limitations make it difficult for him to walk and talk. Even with those challenges, I am proud that he is my son. We relocated to Charlotte, NC many years ago when he made his first trip to Carowinds amusement park. That trip showed us his true love for amusement parks. 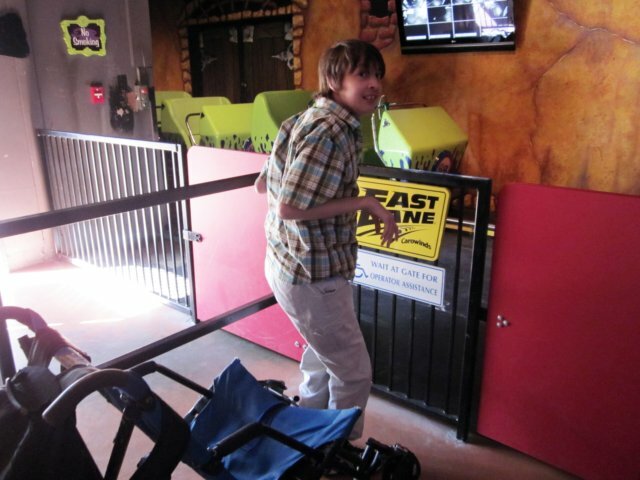 When you mention Carowinds, he says, ‘rides, whee!’ (while putting his hands in the air). Over the years we have taken him to numerous parks but to him they are all still known as Carowinds. Seldom does a week pass where he doesn’t ask for Carowinds. celebrating the true meaning of Easter through an early morning Easter service, we headed out to the park for a fun-filled day! through the regular queue if we could. Our first stop is at guest relations to pick up one of these passes. You can easily find them on the left after entering the main gate. Now that we have our boarding pass, let’s go have some fun! While some of the rides like Intimidator and Afterburn are my favorites, they are too intense for Jeffrey so we’ll skip those today. 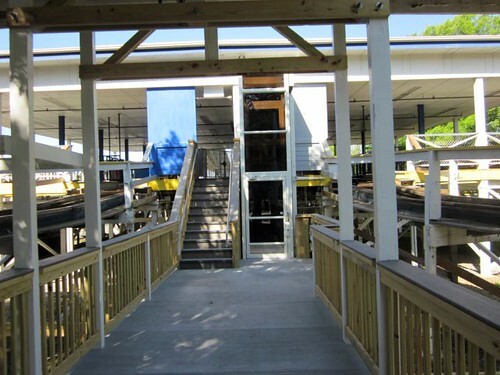 We’re heading over to Carowinds’ new ride for 2012, Windseeker. It’s a great cross between a family ride and a thrill ride. Since Jeffrey isn’t afraid of heights, this is a perfect addition for him. He loved the views and the feeling of soaring high over the park. The wind blew through our hair as we flew through the air and it was very relaxing on this beautiful Easter Sunday morning. If you were listening closely, you probably heard his screams of delight all the way to the outer edges of the park. We’re so close to his favorite ride in the park that it would be an injustice not to take him there. 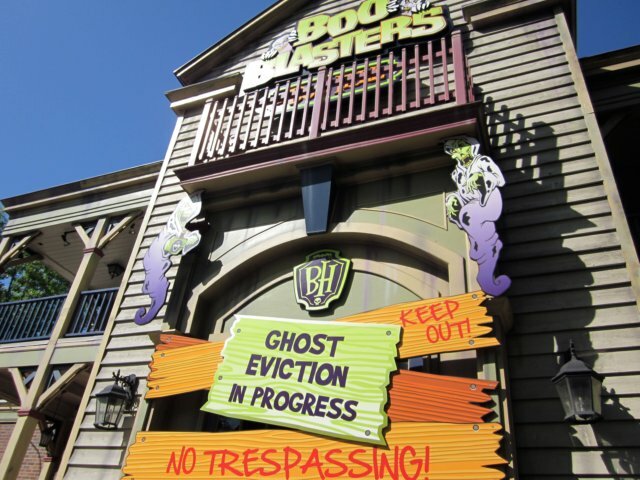 He absolutely loves dark rides, and we always have to make a stop at Boo Blasters on Boo Hill. While he continues to call this dark ride by its former name, the new theming of it has not bothered him in the least. He has probably been through this ride a couple of dozen times over the years but you wouldn’t know it if you were riding with him. Life lesson: Enjoy the moment. Since we hit this ride early in the day and many of the guests were in Planet Snoopy for the Easter festivities, we were able to get three rides in. Jeffrey was ecstatic! 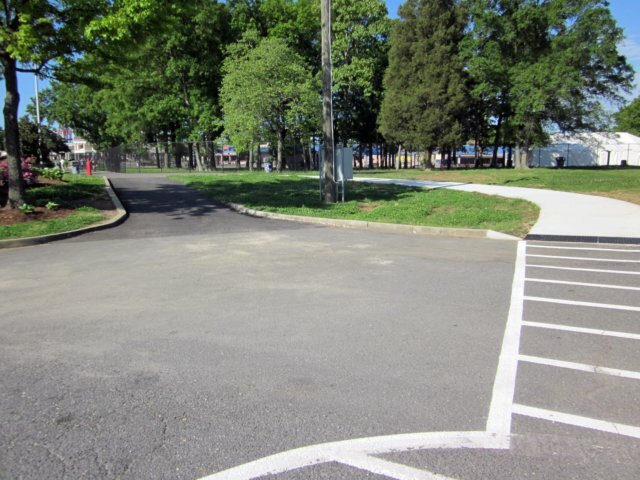 I would like to give a shout out to Carowinds for the separate handicapped entrance that has recently been added. 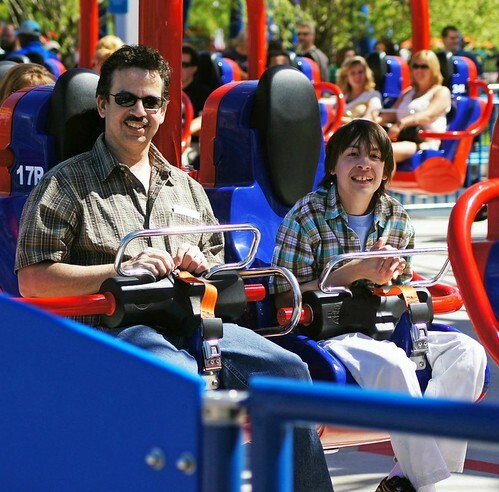 It sure makes it easier for us to get him on to the ride and not be run over by exiting riders. Additionally, it provides a convenient location to store his wheelchair while we’re riding. and it is a good classic wooden roller coaster. Since it is Easter, it is not surprising to see the Easter Bunny making an appearance at the park. 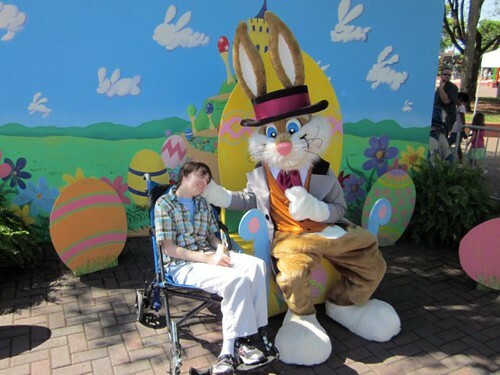 At 21, Jeffrey is still excited to see the Easter Bunny. Life lesson: You will find more to appreciate if you remain young at heart. We generally have a good experience every time we go to Carowinds, but today most of the park workers were phenomenal. Many of them went out of their way to make it a great day for Jeffrey, even though they had to work on Easter. I’m sure some of them had families they would have liked to spend the day with but you never would have known it. Now it’s off to do something that we all take for granted; using the restroom. While it’s not glamorous to write about, it is a fact of life. If you have never tried to navigate a wheelchair through the slalom of a crowded public restroom and then try to engineer a way to get into the corner stall, you’re missing out on something. 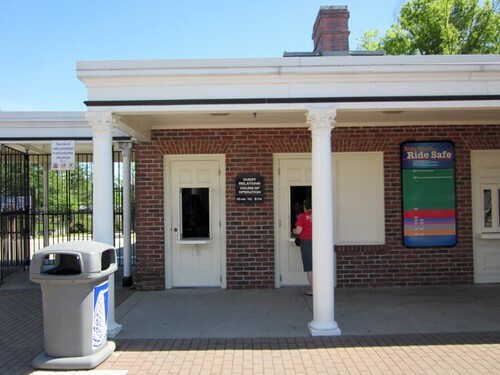 Gone are those days, at least at Carowinds. 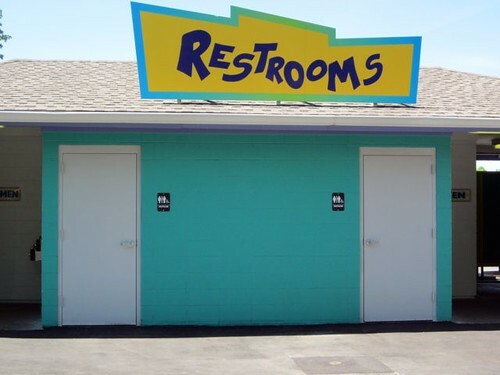 We were pleasantly surprised to find that they have been hard at work again over the winter and nearly every single restroom that we came across had two family/handicapped restrooms available in the front. It is often the little things in life that make the biggest impact on others. We’re getting famished, so it is time to grab a bite to eat at one of the many restaurants. 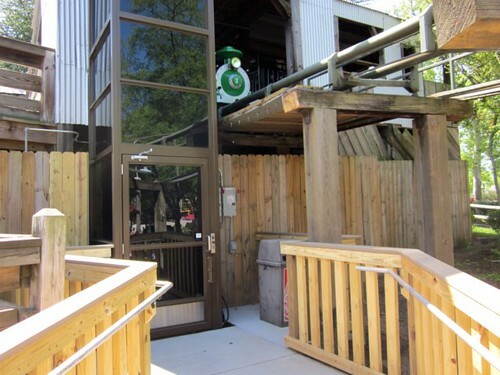 Once again, subtle improvements have been made and additional handicapped seating has been added enabling more families to cool down in an air conditioned space and enjoy their favorite foods which range from fried chicken to burgers and pizza. As we continue to have a fun filled day at the park, we notice that Carowinds also took the time in the off-season to remove the difficult-to-navigate exit ramps at Gr8 Sk8, and Carolina Goldrusher, replacing them with steps and a wheelchair elevator. Those also happen to be two rides that are well loved by Jeffrey and today other riders shared in on his excitement. You can seldom miss being on one of the rides with Jeffrey as he is not afraid to show his love for the rides. Life lesson: Happiness is contagious. the Carolinas can be proud of regardless of their abilities. The improvements, while small in scale when compared to recent additions like Intimidator and Windseeker, really add up and allow Jeffrey and other special people like him to enjoy more of the park. 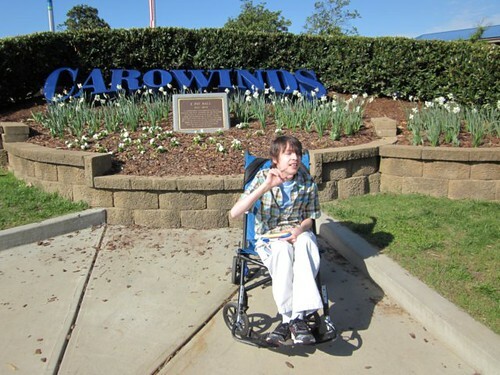 I would also like to thank the friendly staff at Carowinds as well as some park guests who went out of their way to make it a special day for Jeffrey. Most of the way home he told me stories about the rides that he rode and everything that he saw on our Easter excursion to Carowinds. Thank you for taking the time to read our story and learn more about Jeffrey.